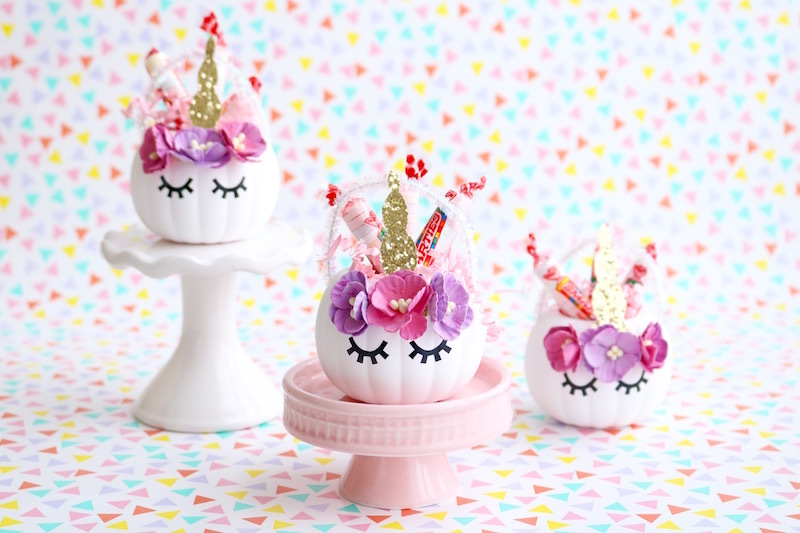 I’m obsessed with unicorns and Smarties® candies and when you combine the two for a Halloween treat, pure magic is bound to happen! My ideal Halloween explores the magical side of things and nothing could be more magical than unicorns. And since unicorns don’t seem to be going anywhere anytime soon, (Yay!) 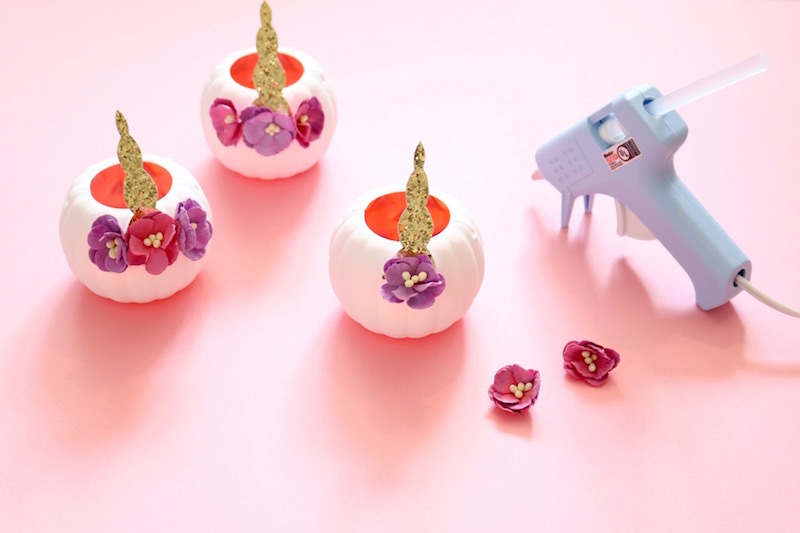 I created these magically adorable Unicorn Pumpkin Candy Holders to gift the special trick-or-treaters in my life! Follow the easy peasy steps below to create your own! 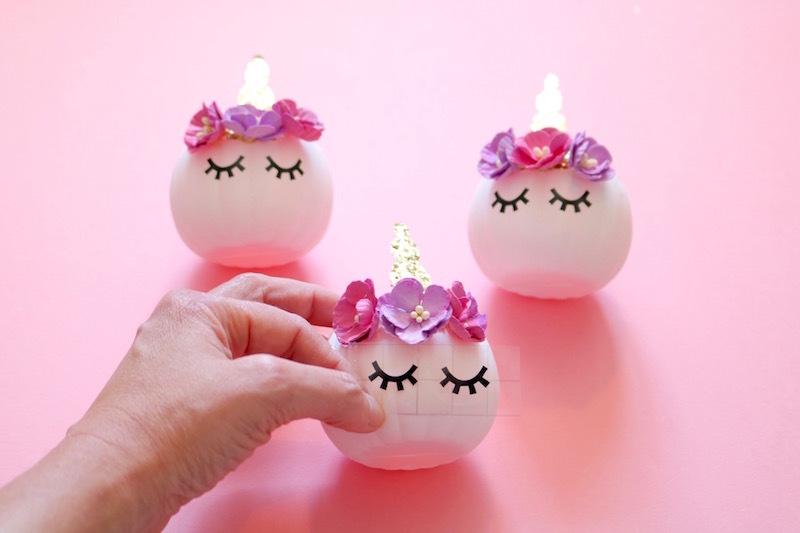 Begin by removing the black handle from each mini pumpkin candy container and painting them a solid color. This will be the body of the unicorn, so I painted mine white. Several layers will need to be applied to cover the orange. Some will still show through slightly from the inside, but the addition of the crinkle paper shred will help hide this. 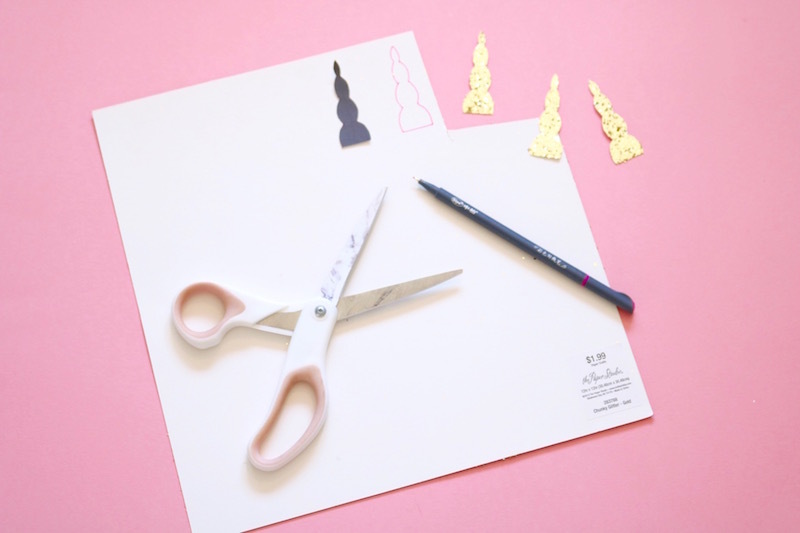 While the paint is drying, use the unicorn horn template to trace and cut out your horns. 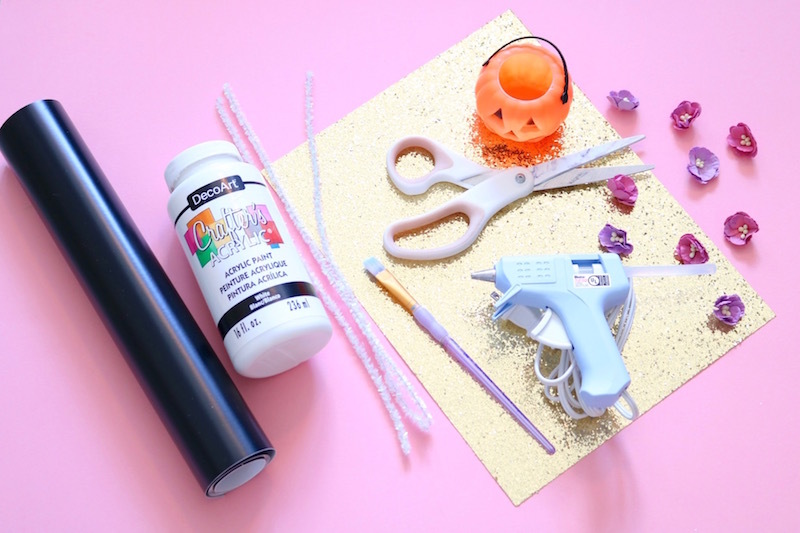 Alternatively you could use the Cricut pattern here, but I prefer to cut by hand to save my Cricut from the heavy lifting since the glitter paper is so thick. 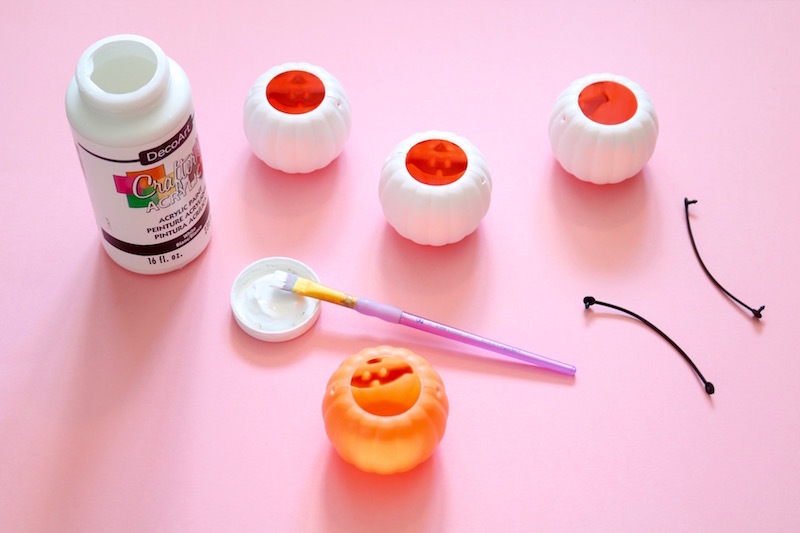 At the same time, use the Cricut pattern to cut the eyelashes on black vinyl – these I definitely cut on my Cricut. All those intricate cuts would drive even the sanest person batty! 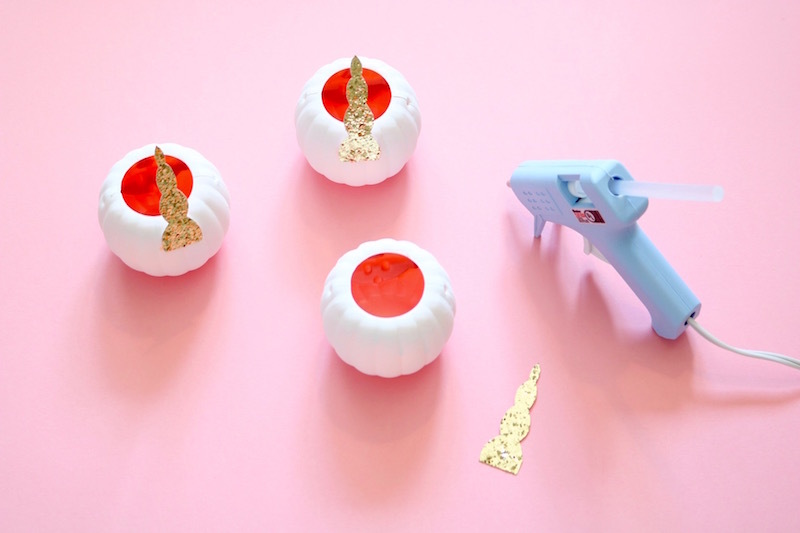 Once the paint has fully dried and your pumpkin candy containers have good coverage, attach a unicorn horn to the top portion of the pumpkin using hot glue. I came down about half an inch from the top. Next, add some flowers, again using hot glue. You’ll want to apply the center flower right on top of the horn itself to hide the bottom of it. Now add the eyelashes using the vinyl transfer tape. You could replace the original black handle at this point, but where’s the fun in that? 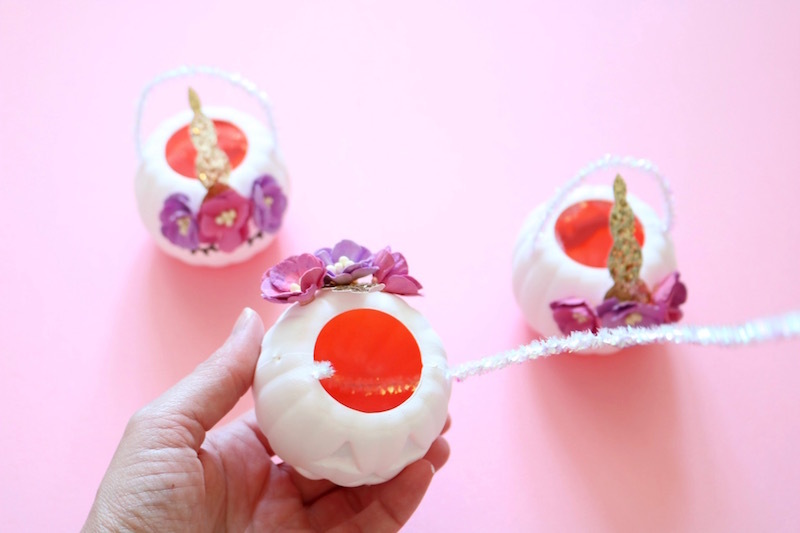 Instead, thread an iridescent pipe cleaner through each of the holes and twist them together to secure onto the pumpkin. Tuck their “tails” up under the front of the pumpkin’s lip. 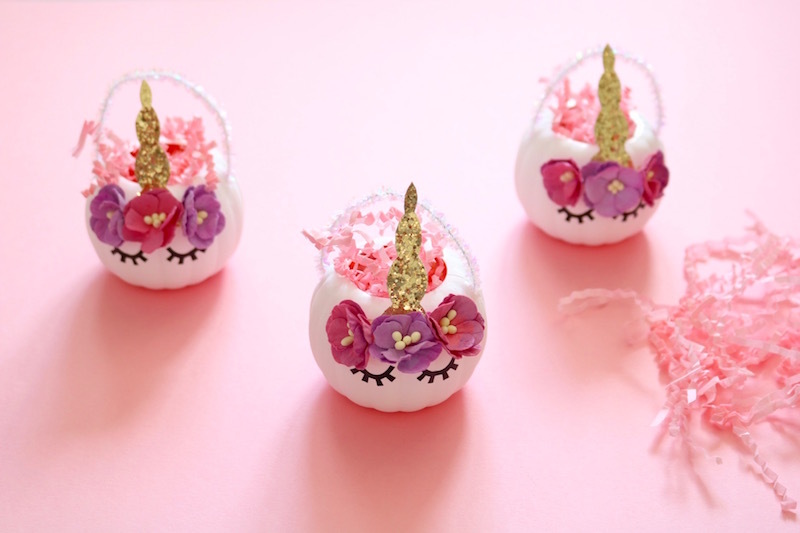 Now fill each of the unicorn pumpkins with a bit of crinkle paper shred. I chose pink for mine, but you can use any color you’d like. 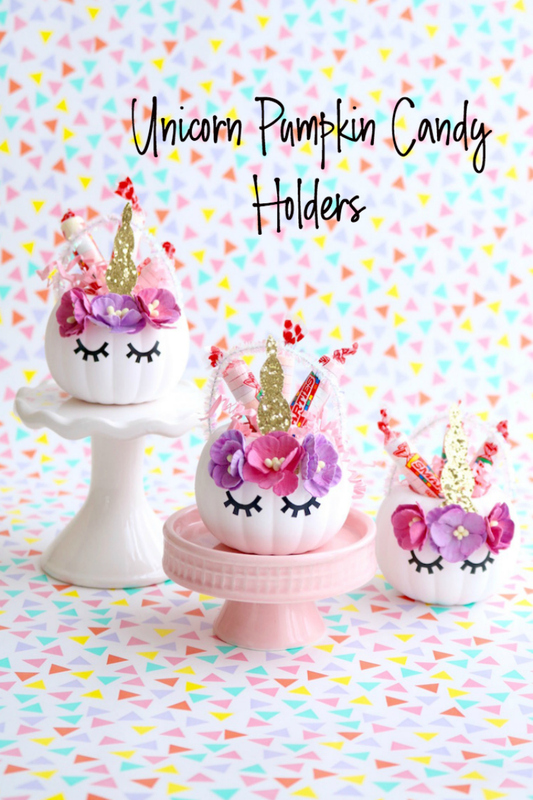 Finally, fill each Unicorn Pumpkin Candy Holder with treats (I chose Smarties® of course! Not sponsored – I just love them!) and gift to all your fave trick-or-treaters! For more Halloween fun, check out the un-boo-lievably cute details in this purple, black and white Boo-tiful Ball. 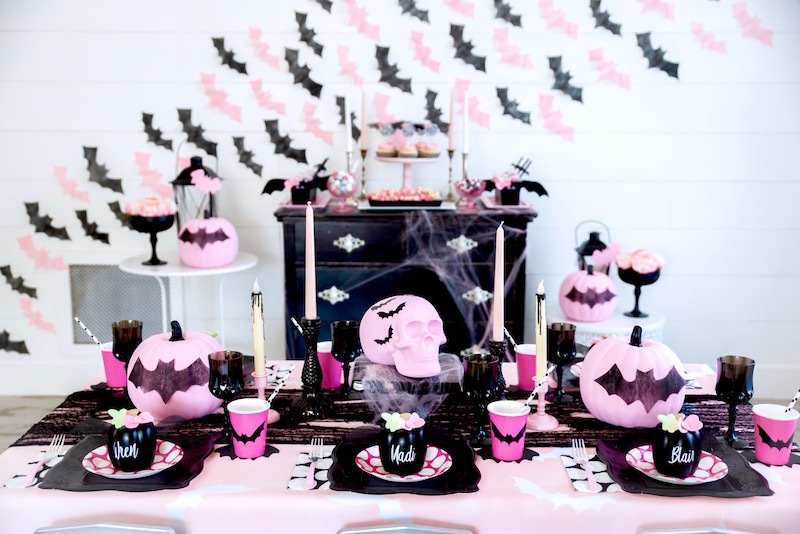 And for more girly Halloween fun, be sure to check out this fang-tastically adorable Bat-tacular Ghouls’ Night Out! Annaliese Johnson is a party stylist and owner of Made of Sugar and Spice Parties, who’s work has been featured on Kara’s Party Ideas, Catch My Party, Pop Sugar Moms, Project Nursery, Bird’s Party Magazine and Everyday Party Magazine, and she is a contributor for Oriental Trading’s Fun365 website. Her love of color, pretty girly things, glitter, and creativity help transform every day occasions into the best day ever. When she’s not crafting or planning parties, you can find her spending time with her firefighter husband, son and three dogs.